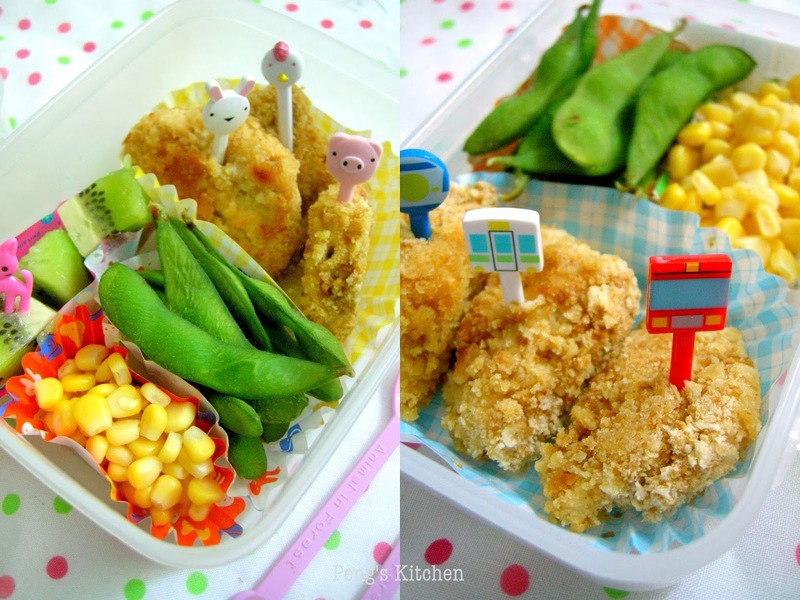 This is another popular kiddy's food, chicken nuggets. They just don't get sick of eating this everyday! It is always so convenient to pick up a pack of frozen nuggets from the supermarkets. But do you notice the list ingredients indicated on the package? Other than the chicken meat, it usually contains some unusual ingredients like flavours enhancer? emulsifiers? chicken fats?! colourings? and the list goes on.....With homemade ones (healthier option) you know exactly what are the stuffs you are adding into the nuggets and it is really easy and quick to make it your kitchen! Compare to the previous homemade chicken nuggets I've tried, this current one is straight forward, just use chunks of fresh chicken breast and coat with seasoned mayonnaise and biscuits crumbs and you are ready to send them into the oven! Only require simple seasoning : mayonnaise, garlic & herbs blends, salt & pepper, crushed wheat crackers and of course fresh chicken breast chunks! Be creative and create your own concoction of seasoning by adding parmesan cheese, chilli flakes, varieties of dried herbs etc. Combine mayo, milk, garlic & herbs mix, salt & pepper. Stir well. 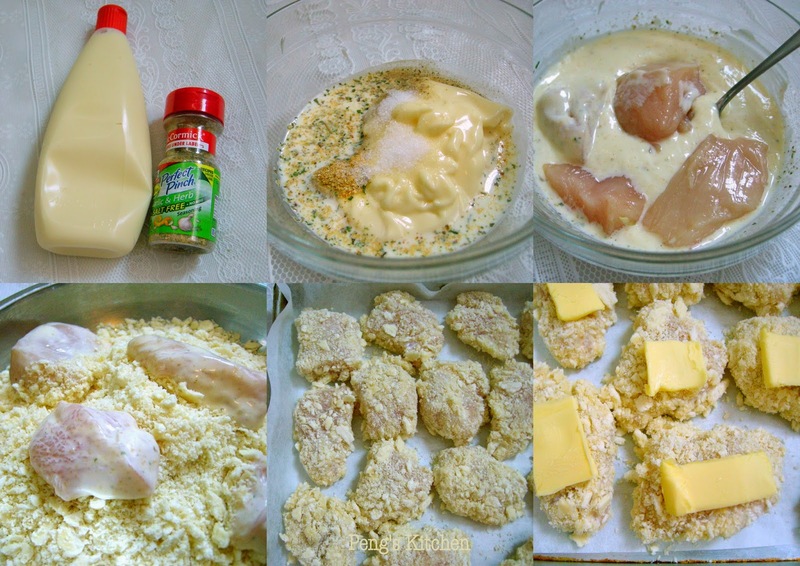 Toss in chicken chunks and coat each pieces evenly with mayo mixture. Gently scoop the mayo coated chicken pieces onto a plate of crushed cream crackers. Toss gently to coat the chicken with crushed crackers. Press down firmly to adhere well. Lightly lift the chicken pieces onto a lined baking sheet. Place a small thin slice of butter over each chicken pieces. Bake in preheated oven at 200 deg cel for 10-12 mins on each side till golden brown and crisp.